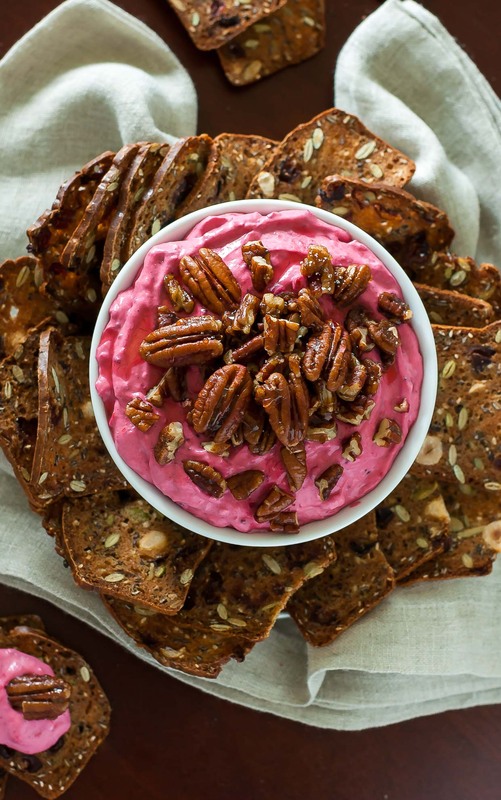 This fun and festive holiday cranberry dip is swirled with cream cheese and honey and topped with the most delicious candied pecans. It’s perfect for all your holiday needs from parties to potlucks to family gatherings galore! This recipe barely made it onto the blog today, but I swooped in at the last minute and got it done like a BOSS! After posting a teaser photo on Instagram this morning, I was SO EXCITED that I promised to type this recipe up during the chickpea’s mid-day nap, jinxing the crap out of the remainder of the day. No nap Nancy strikes again! Woof. Instead of recharging like a normal 2 year old, she opted for a workout. “JUMP MOMMA! LET’S GO!” And so we went. I heart that crazy toddler logic of hers. It’s that same logic that associates Target trips with hide and seek and grocery trips with no less than 50 trips to the lobster tank to wave hello to her friends. I mean why else would we be there? To buy ALL THE CRANBERRIES, that’s why! The second they hit stores it was on like Donkey Kong, people! I’ve already made and froze a ginormous batch of cranberry sauce, snagging just enough from the pot to make this delightful spreadable dip. You’re gonna LOVE it! It’s sweet yet tart with a swirl of honey and a kiss of cinnamon and just… ahhhhI love it! The pecan topping is optional but SO DELICIOUS! Sometimes I use walnuts instead and it’s equally magical. You can even get supper nutty and add a handful or two into the food processor along with the dip itself. Then add more as the topping. You’ll thank me later. 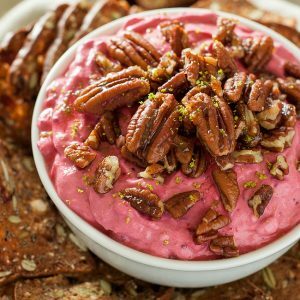 This fun and festive holiday cranberry dip is swirled with cream cheese and honey and topped with the most delicious candied pecans. It's perfect for all your holiday needs from parties to potlucks to family gatherings galore! 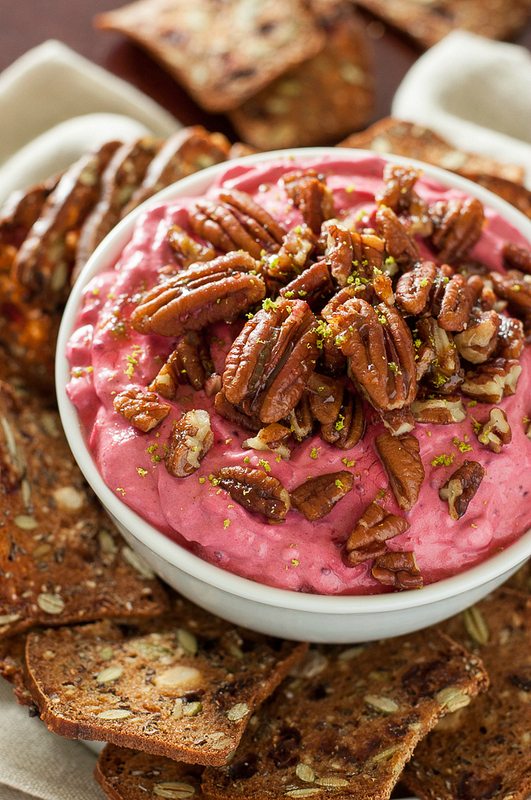 Feel free to use pecans or walnuts for this recipe. As I mentioned above you can get super nutty and additional nuts into the dip too. It's beyond fantastic that way! Serve with an array of fun crackers pretzels, grahams, apple slices, sliced pears, and even fluffy pita wedges.The crackers I used are multi-seed cranberry hazelnut crisps. Add to a food processor with your cranberry sauce, honey, lime juice, cinnamon, and salt. Next add about 1/2 the lime zest and reserve the rest for a zesty (hah!) green garnish. The lime is 100% optional (I love this spreadable dip both ways!) but adds a welcome burst of refreshing citrus. If you love limes, totally snag one for this dip. Blend away to creamy cranberry perfection! Give it a taste and feel free to adjust honey and cinnamon as desired. Just be sure to unplug the food processor before trying to lick it clean. You're welcome. Top with your candied pecans (instructions below) and a sprinkle of lime zest for a burst of color. NO FOOD PROCESSOR? No problem! You can totally do the legwork by hand. Stir baby stir! CANDIED PECANS: Feel free to use whole pecans or chopped, whichever you prefer! Heat a skillet or saucepan to medium heat and butter to melt. Next add in your pecans, honey, salt, and sugar. Saute for 5-6 minutes and pour onto parchment paper or a cutting board to cool, using a spatula to separate the nuts. 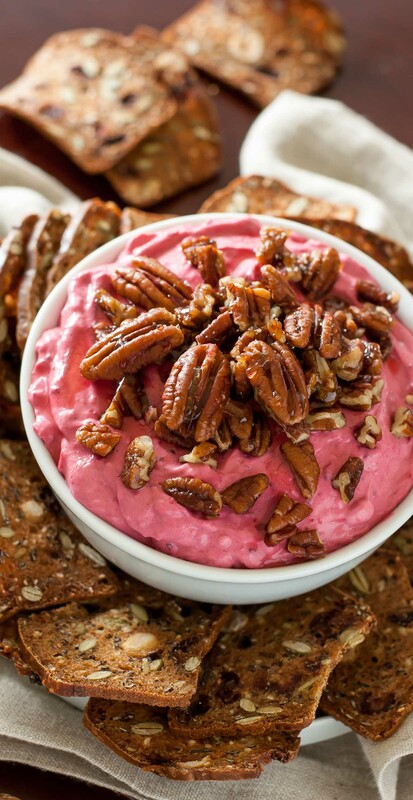 Otherwise you'll have yummy pecan brittle that will probably end up in your face instead of on top of this dip. It's so good! Allow to cool for several minutes until the coating hardens and your pecans have officially been candied! Woot! For the cranberry sauce, I used my slow cooker cranberry sauce recipe. The sauce can also be whipped up stove top too. I like to make a giant pot of sauce before the holidays even begin and freeze it, since it defrosts marvelously! This way there's one less side dish I have to make for Thanksgiving! Making this after Turkey Day? You're in luck! Just snag some sauce and make this as an appetizer for your next get together! Enjoy! It’s perfect for a party and because the leftovers of this festive holiday cranberry dip will keep for several days in the fridge, you can squirrel some away to spread on your bagel or croissant the next morning! YES! It also makes an amazing sandwich spread, especially with a pile of Thanksgiving leftovers. Make it for friends. Make it for family. Make it for yo face! Whatever you do, make enough for that croissant the next morning. This was a great way to use the cranberry sauce I had leftover! Super tasty!! This is going to be such a hit at our family Thanksgiving celebration! I can’t wait to make it again for everyone to try. Yum! Did you make the crisp bread? It looks heavenly, can you supply the recipe please? Thanking you in advance.